What a phenomenal Royal Oak this is with a super rare and attractive “Salmon” dial. Retailed by world famous watch store ASTRUA in Turin ,we often find vintage double signed Rolex Astrua watches at auction. E serial dates it to 2004. This specific timepiece is the classic Jumbo Royal Oak in it’s contemporary reincarnation reference 15202 , 39mm in diameter and ultra thin movement caliber 2121 in use since the early 70s. Fitted with the salmon dial also matched by the Astrua box , it is accompanied by it’s full kit of box and papers. The watch is in great condition with nice prominent satin finish, no dings or dents, just signs of gentle wear. The bracelet is tight with no stretch and it has the beautiful AP logo clasp. Fully linked. Exhibition caseback showing the thin caliber with a decorative hand detailed gold rotor. 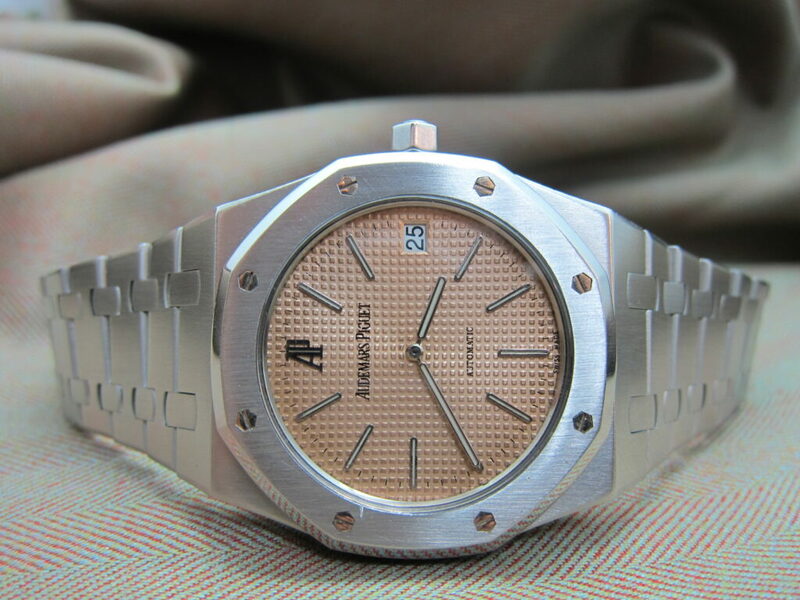 A super watch for the Royal Oak collector!